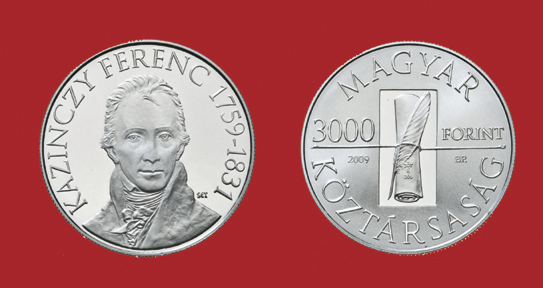 Hungary is honoring the 250th anniversary of the birth of Ferenc Kazinczy with these two coins. Kazinczy was a writer, poet, the leading figure of language reform in the 19th century and a member of the Hungarian Academy of Sciences. His first work was published in 1775 and he was involved in founding the literary magazine, Magyar Museum in 1788 and the publication of his own journal, Orpheus in 1790. In 1794 he was implicated in a conspiracy led by Ignác Martinovics and was arrested and sentenced to death for high treason. The sentence was commuted by royal decree and he was imprisoned. After his release he lived amid family disputes and financial hardship. In spite of this, he devoted most of his time to the great goal of his life — renewing and improving the Hungarian language. Many new writers began presenting him their manuscripts for comments. It was due to his efforts that language reform became a matter of national interest. He extended his work to phraseology, semantics, sentence structure and expressions for linking words. He was active in the preparations for the foundation of the Hungarian Learned Society, later the Academy of Sciences. In April 1831 he contracted cholera while on a long trip though northern Hungary. Though he made it home, he could not escape the disease and became a victim of the epidemic.